← “Scrutiny” Week September 2014. £14.5million “Clean” City fund still not reported!! Hot on the heels of the excellent “Total Carbon Footprint” report released two days ago comes a much shorter report. Both will be discussed next Monday, 22nd September, at the next meeting of the “People’s Environmental Scrutiny Team”. If you can’t come, please do this. 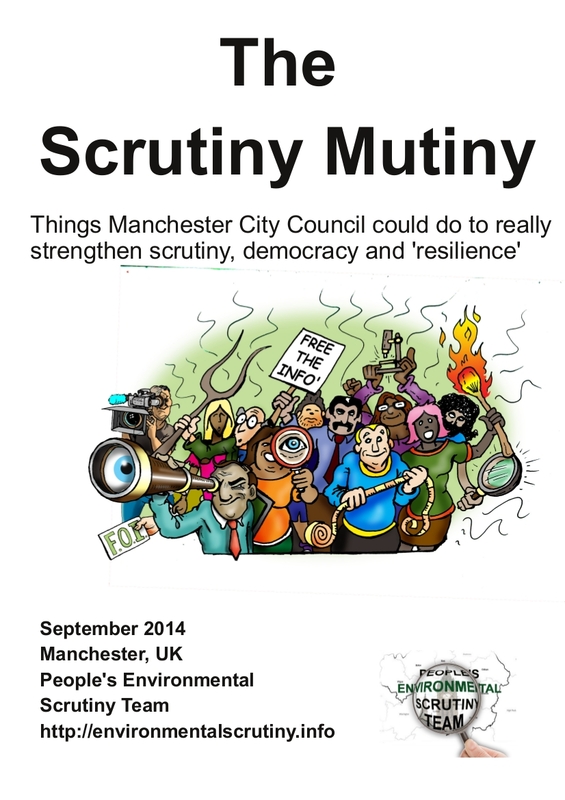 Manchester City Council has six scrutiny committees. In March the committee that sits over them (I know, I know) decided to send out a survey. Very few people responded (it was poorly publicised). Nonetheless, a report about that survey is being discussed next week at 5 of the six committees. If you want to come to any of the scrutiny committee meetings next week, do get in touch; environmentalscrutiny@gmail.com . Here’s a short video that explains more. PS Thanks to Marc Roberts for another brilliant cover image! This entry was posted in Campaign Update, capacity building, Democratic deficit. Bookmark the permalink.